Grasp a dumbbell in each hand using a neutral grip (palms facing inward). Lie supine (on your back) on a flat bench and allow your arms to hang down behind you until you feel a mild stretch in your shoulders. Exhale as you raise the dumbbells and simultaneously supinate your wrists until your elbows are by your sides, your forearms are vertical and your palms are facing upward. Inhale as you reverse the movement and return the dumbbells to the starting position. Do not fully extend your elbows. The supine dumbbell curl can be dangerous for the tendons of your biceps brachii. 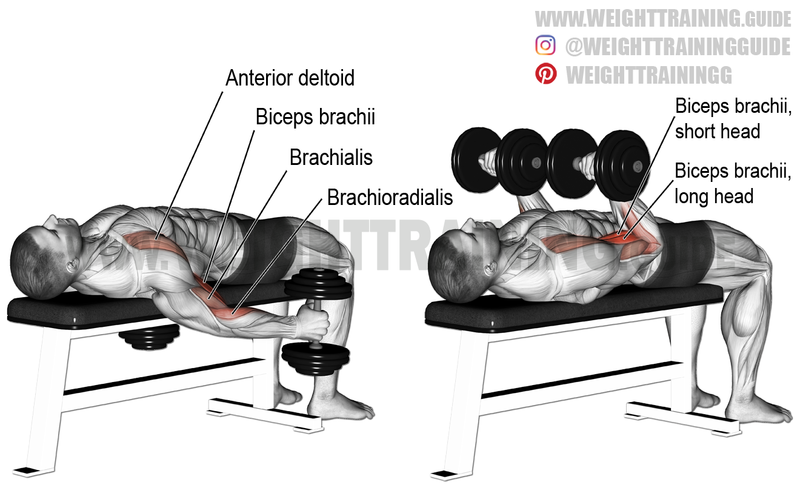 Use the exercise only after fully warming up your biceps brachii and do not go as heavy as you would with the dumbbell curl. The reason for lying on your back is to allow your arms to hang down behind you, which puts the long head of your biceps brachii into a stretched position. This allows the long head to get more involved in the lift because stretched muscles/muscle heads can contract with more force than muscles/muscle heads that are less stretched or loose. Since there is more shoulder flexion in the supine dumbbell curl than there is in the incline dumbbell curl, I classified it as a compound exercise. Some authorities recommend that the upper arms remain fixed and only the forearms move. This takes shoulder flexion out of the exercise and keeps the long head of the biceps brachii stretched throughout the range of motion. Without significant shoulder flexion, the supine dumbbell curl is an isolation exercise. Is not also sholder exsercize?